Now only 11 Credits for Blackberry VIP service and codes are faster than before. can you do the storm 9530 from telus? 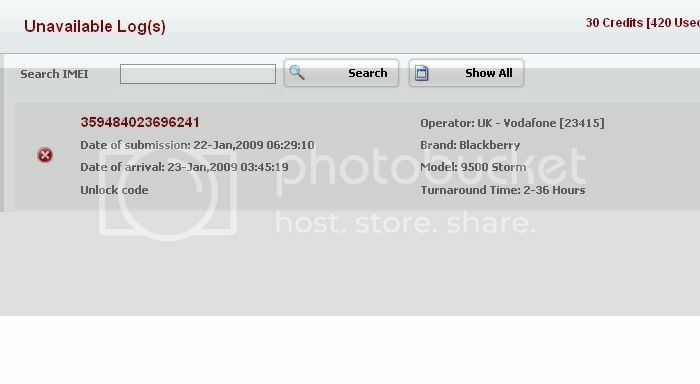 Storm 9500 from BlackBerry Ireland : Vodafone - Eircell not supported, why put in list? Read data with this logger software and give me data. ill give you code. as i see you request code for this via this service. if everything ok with the payment than it takes upto 24 hours. please wait a little more. yes it can be unlock. you need to read data from phone with logger from post #21 and i can provide unlock code. Correct procedure for this vip service. Cant donwload, please upload to rapidshare.com for other BB phone, the phone which i submitted before i already have unlock code!